When applying for a new job as an executive assistant, you may want to include a cover letter in your application. To make it easy for you, we have a wide range of pre-drafted and ready to use cover letters. These letters are available in a wide range of formats; they are easily editable, printer friendly and can also be emailed. They can be used as administrative assistant cover letters and professional cover letters too. 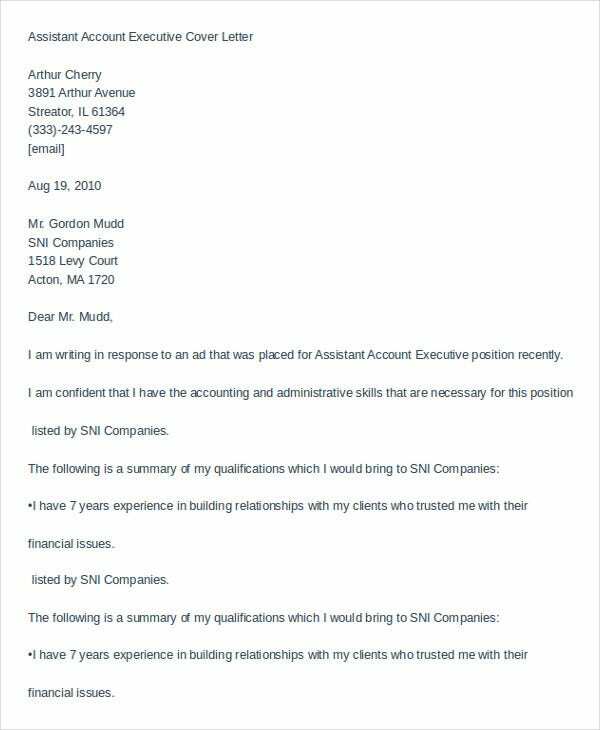 The sample cover letter for executive administrative assistant is available in Word format. This template can be easily edited. The user can add details of his strengths, skills and basic background information. The executive assistant cover letter is ideal for applicants who have no prior professional experience. This template is available in Word format. 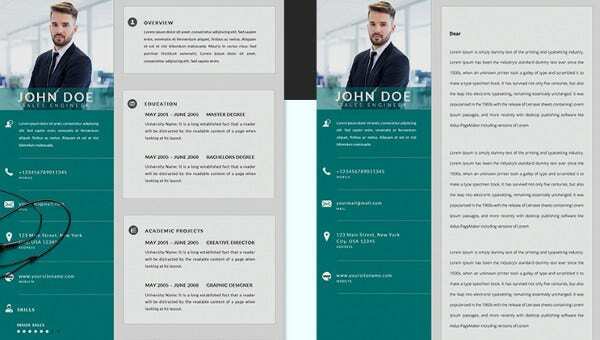 The user can add details of his skills, educational background information and other relevant data to this template. > What Is The Target Audience For The Executive Assistant Cover Letters? 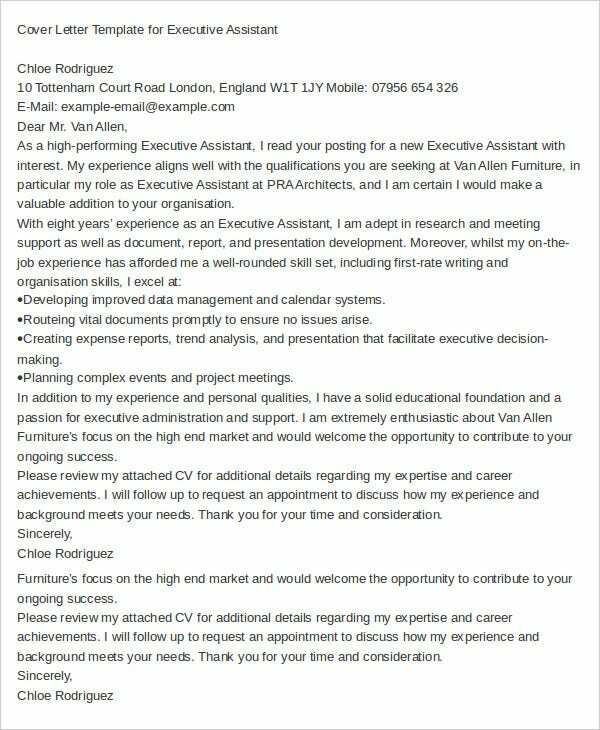 Typically anyone who is looking to get a job as an executive assistant will find these sample cover letters very useful and handy. 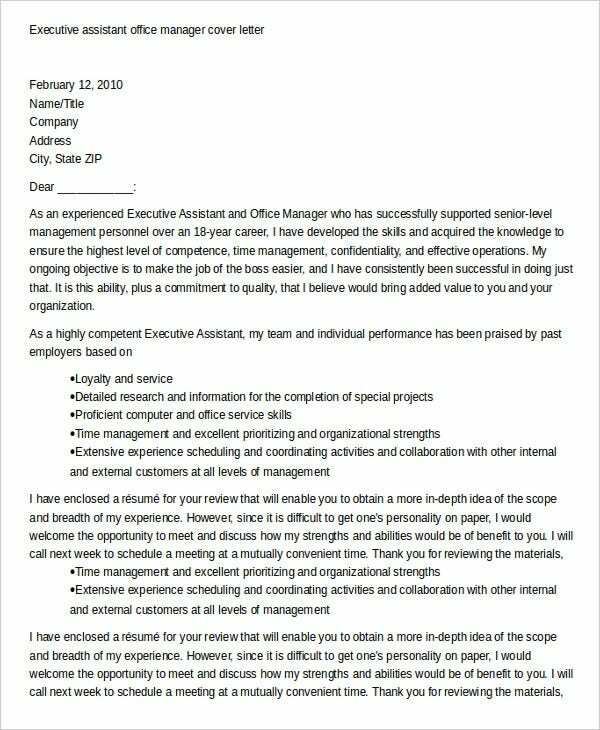 Senior executives, junior executives, personal assistants, office managers, administrative assistants and various others can use these cover letters to apply for a new job. Even individuals who have recently graduated and have no prior work experience, but are looking to get a job as an executive assistant can use these cover letters to attach to their resumes when applying for a job. So, if you’re submitting you resume to a firm with the intention of getting a job as an assistant, these templates are ideal for you. 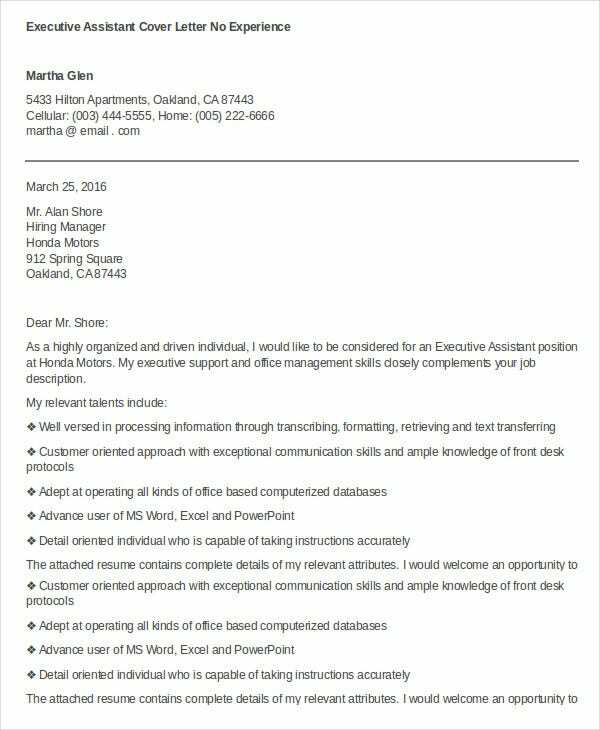 The executive assistant office manager cover letter is available in Word format. The user can add details of his objectives, skills, talents, experience and other important and relevant information. 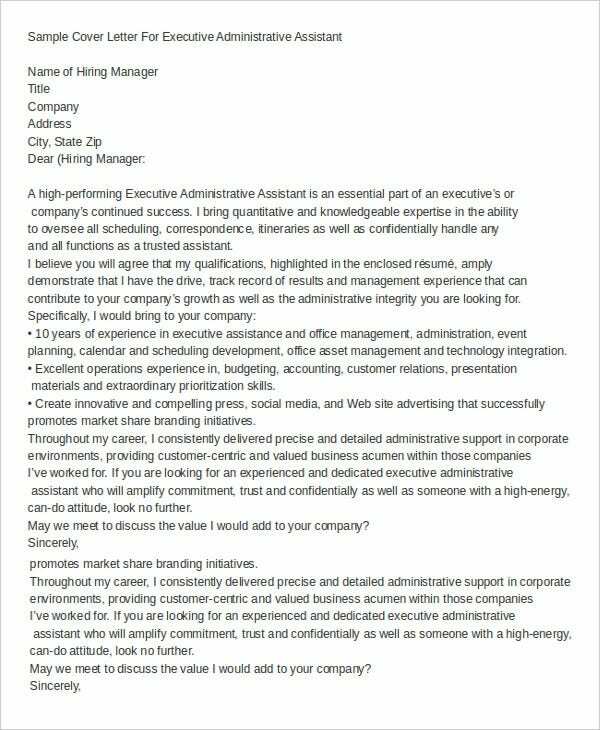 The executive personal assistant cover letter is ideal for those looking to get a job as an executive personal assistant. 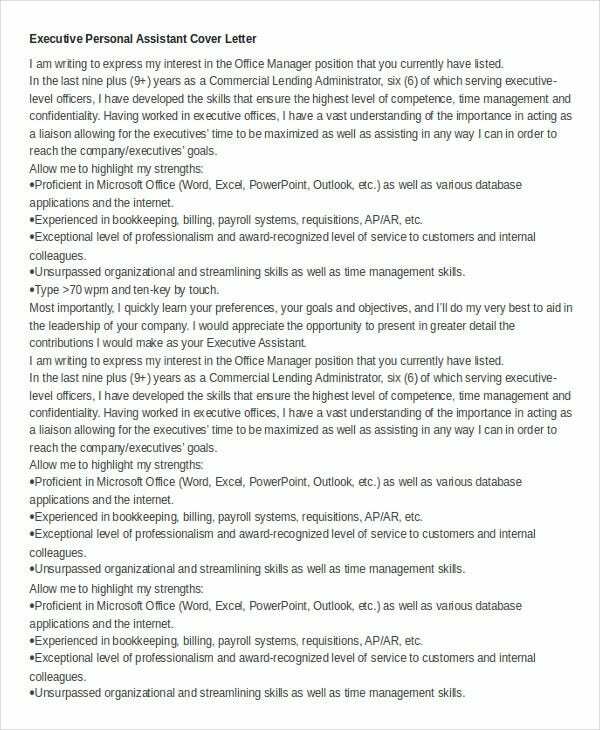 The user can add details of his skills, highlight his strengths and also add other information to this cover letter. Individuals who are looking to get a job as a senior executive assistant will find these example cover letters very handy. This template is available in Word format and is easy to edit. > What Are The Benefits Of Using The Sample Cover Letters? The sample cover letters are beneficial for several reasons. These templates are absolutely free of cost. The user does not need to pay a professional a fee to get them drafted, he can just download and edit these ready to use templates for no charge. Example of cover letters are also beneficial because they are available in universally accepted and extremely convenient formats. The letters can be accessed on most operating systems including smartphones and tablets. Lastly, when attached to an executive administrative assistant resume, such professionally drafted cover letters always leave a good impression on the mind of the interviewer, thereby increasing the chances of the applicant to bag the job. 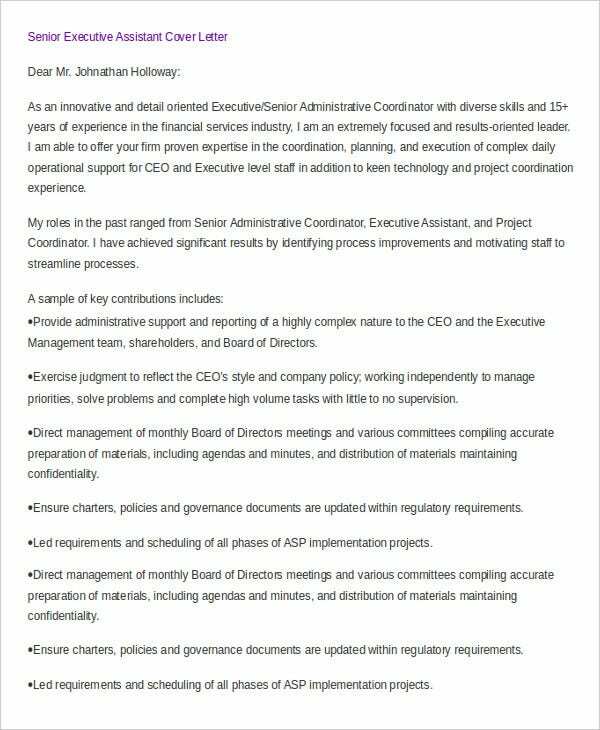 So, if you’re submitting you application for a new job as an executive assistant, these cover letters are just what you need. They will make your application look far more professional and are bound to leave an excellent impression on the mind of your interviewer. Select a cover letter from the above-mentioned list, download it, edit it and submit it along with your resume when applying for a new job.